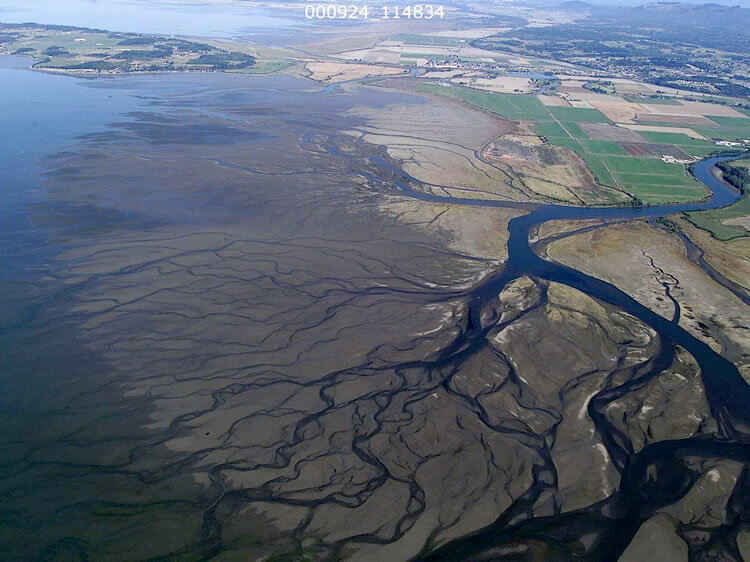 Estuarine ecosystems in Puget Sound occur as three main types: large river deltas, embayments, and their interconnecting beaches. Rocky coasts also occur prevalently in northern Puget Sound (Shipman, 2008). River deltas: River deltas develop at the mouths of large rivers and are formed by river sediment that is deposited over broad and low-lying plains (Shipman, 2008). There are 16 recognizable deltas that now cover just over 188 km2 (Simenstad et al., 2011)—equivalent to more than twice the area of Lake Washington. Embayments: Embayments are semi- or total enclosed estuaries and lagoons often formed behind barrier beaches (Shipman, 2008). Types of embayments include barrier estuaries, barrier lagoons, closed lagoons and marshes, and open coastal inlets. There are 422 embayments (179 barrier estuaries, 142 barrier lagoons, 101 closed lagoons and marshes, and 157 open coastal inlets) that currently cover 90.8 km2 of the Puget Sound shoreline (Simenstad et al., 2011). Beaches: Beaches include coastal bluff-backed beaches and barrier beaches (Shipman, 2008). About equal numbers of bluff-backed and barrier beaches total 1,788 beach segments (Simenstad et al., 2011). Rocky coasts: Rocky coasts of the northern Puget Sound include pocket beaches and plunging and platform shorelines (Shipman, 2008). There are 2,783 segments of these complex shorelines (364 plunging, 1,409 platform, and 1,010 pocket beaches) (Simenstad et al., 2011). Since historic surveys from the mid- to late-1800s, three deltas have virtually disappeared as natural ecosystems, and the total length of river deltas in Puget Sound has declined by 47%. In total, more than 232 km2 of natural deltas have vanished, almost 56% of their historic presence (Simenstad et al., 2011)—equivalent to 2.5X the area of Lake Washington. The various tidal wetland ecosystems that once composed these massive deltas have been lost to different degrees; see below. Even the area of small embayment estuaries have diminished by 69 km2, or 67% of the historical 102 km2 of small estuaries that once occurred along the shores of Puget Sound—a loss still 1.2 greater than the area of Lake Washington. The length of embayments has also declined: barrier estuaries have declined by 44%, barrier lagoons by 46%, closed lagoons and marshes by 48%, and open coastal inlets by 45% (Simenstad et al., 2011). The length of bluff-backed beaches in Puget Sound has decreased by 8% and the length of barrier beaches has declined by 12% since the mid- to late-1800s (Simenstad et al., 2011). The shoreline lengths of the complex rocky shorelines have also diminished to some degree, by 9.5% in the case of pocket beaches, 9.3% in the case of plunging rocky and 10.4% of rocky platforms (Simenstad et al., 2011). There are four main types of tidal wetlands in the estuaries of Puget Sound: mud flats, emergent marshes, scrub-shrub (willow and other woody vegetation) tidal wetlands, and tidal freshwater swamps (the once great tidal swamps, dominated by Sitka spruce, that once occurred across the region) (Simenstad et al., 2011). These tidal wetlands are important to the health of estuaries. They provide shelter and food for salmon and other fish, help protect the shoreline from storms and large waves, and filter runoff from the land (Martínez et al., 2007). Tidal wetlands in Puget Sound have diminished by 301 km2 since the mid- to late-1800s from 518 km2 to 217 km2 (Simenstad et al., 2011)—a decline 3.4X the area of Lake Washington or the size of 56,303 football fields. Mud flats: In the mid- to late-1800s, there was 166 km2 of mud flats in Puget Sound. Since then, the area of mud flat has declined by 24% to an area of only 126 km2 (Simenstad et al., 2011). Emergent marshes: Historically, there was a total of 161 km2 of emergent marsh in Puget Sound: 86 km2 in deltas and 75 km2 in non-deltas. Currently, there are only 46 km2 of emergent marsh in deltas and 32 km2 in non-deltas—a 46% decline in deltaic emergent marsh and a 58% decline in non-deltas (Simenstad et al., 2011). Scrub-shrub tidal wetlands: Historically, there was a total of 64 km2 of scrub-shrub wetlands in Puget Sound: 55 km2 in deltas and 9 km2 in non-deltas. Currently, there is less than 1 km2 of scrub-shrub in deltas and less than 1 km2 in non-deltas – declines of 99% and 92%, respectively (Simenstad et al., 2011). Tidal freshwater swamps: Historically, there was a total of 126 km2 of tidally influenced freshwater swamps in Puget Sound: 108 km2 in deltas and 18 km2 in non-deltas. Currently, there are only 11 km2 of tidal freshwater swamps in deltas and less than 1 km2 in non-deltas—declines of 90% and 95%, respectively (Simenstad et al,. 2011). Humans have modified coastal estuaries in many ways, including building dams, constructing shoreline armoring, and filling wetlands and intertidal flats for agriculture and housing. Changes to the Puget Sound watershed influence the health of coastal estuaries by altering groundwater runoff and erosion of sediment. Watershed changes include the development of industry and the construction of towns and cities, but also logging of forests for agriculture. Only 84% of the Puget Sound watershed has natural land cover, while the remaining 16% is considered developed (Simenstad et al., 2011). As of 2006, there were 436 dams in the Puget Sound watershed (Simenstad et al., 2011). Dams alter the water flow of rivers and trap sediment, which affect deltas and embayments at the mouths of these rivers and streams. For example, there was nearly 19 million cubic meters of sediment trapped behind the Elwha and Glines Canyon Dams on the Elwha River (Duda et al., 2011) – enough sediment to fill a football field to the height of the Space Needle more than 19 times. The amount of artificial shoreline has increased by 3,443% since the mid- to late-1800s (Simenstad et al., 2001). For example, shoreline armoring – such as bulkheads and riprap – has been constructed on an average 27% of the Puget Sound shoreline, but as high as 63% of the central Puget Sound shoreline (Simenstad et al., 2011). A total area of 40 km2 historically natural shoreline has been covered with fill – enough to cover 7,475 football fields (Simenstad et al., 2011). Breakwaters and jetties cover 37 km2 of historically natural shoreline (Simenstad et al., 2011). Between 2006 and 2014, the Estuary and Salmon Restoration Program assisted with 55 restoration and protection projects throughout Puget Sound. There were 17 projects in beach systems, 16 in embayment systems, and 22 in river delta systems (ESRP, 2015). Between 2013 and 2015, the Puget Sound Acquisition and Restoration (PSAR) program funded projects to restore and protect 2,024 estuary and nearshore acres, 1,682 floodplain acres, and 189 river and stream miles (Puget Sound Partnership, 2015). Floodplains by Design: In 2013, the Washington State Legislature provided $50 million in grants for floodplain management projects, of which $33 million was provided to “nine specified multi-benefit floodplain projects in the Puget Sound basin that were early examples of the Floodplains by Design concept.” (Ecology, 2015). In the Nisqually River delta, 3.64 hectares (ha) of tidal wetland was restored in 1996, 8.50 ha in 2002, 40.47 ha in 2006, and 308.37 ha in 2009 (Nisqually Delta Restoration, 2011). In the Stillaguamish River delta, 150 ha of tidal wetland was restored in 2012 (Nature Conservancy, 2015). In the Snohomish River estuary, there are 17 restoration project sites that have been completed or are in the planning stages (Tulalip Tribes, 2015). Duda, J.J., Warrick, J.A., and Margirl, C.S., eds. (2011). Elwha River dam removal – Rebirth of a river: U.S. Geological Survey Fact Sheet 2011-3097, 4 p.
Martínez, M.L., Intralawan, A., Vázque, G., Pérez-Maqueo, O., Sutton, P., Landgrave, R. (2007). The coasts of our world: ecological, economic and social importance. Ecological Economics, 63, 254-272. Puget Sound Partnership (2015). Puget Sound Acquisition and Restoration Fund fact sheet. Retrieved from: http://www.psp.wa.gov/PSAR.php. Shipman, H. (2008). A Geomorphic Classification of Puget Sound Nearshore Landforms. Puget Sound Nearshore Partnership Report No. 2008-01. Published by Seattle District, U.S. Army Corps of Engineers, Seattle, Washington. Simenstad, C.A., Ramirez, M., Burke, J., Logsdon, M., Shipman, H., Tanner, C., Toft, J., Craig, B., Davis, C., Fung, J., Bloch, P., Fresh, K., Campbell, S., Myers, D., Iverson, E., Bailey, A., Schlenger, P., Kiblinger, C., Myre, P., Gerstel, W., and MacLennan, A. (2011). Historical change of Puget Sound shorelines: Puget Sound Nearshore Ecosystem Restoration Project Change Analysis. Puget Sound Nearshore Ecosystem Restoration Project Report No. 2011-01. Published by Washington Department of Fish and Wildlife, Olympia, Washington, and US Army Corps of Engineers, Seattle, Washington. Puget Sound in this case is defined broadly to include the Strait of Juan de Fuca, Hood Canal and the San Juan Archipelago. See the Geographic Boundaries section of the Puget Sound Fact Book for more information. Brittany Jones is a graduate student at the University of Washington School of Aquatic and Fishery Sciences.